Just received my king 3 piece quilt. It’s gorgeous!! The colors are vibrant. Better than the picture. The price was just right. The only problem I have with this quilt set is that the quilt is to short. I ordered a queen, I'm wondering if I had ordered a king would it had fit my queen size bed better. Over all the quilt set is very nice. I'm not crazy about the yellow gray combination, but the lady I ordered this for simply adores it. she loves all things yellow. Its a very good quality quilt and is quite cheerful. I almost always decorate with quilts because they are easier to launder than bulky comforters while still providing adequate warmth. You can't go wrong with Overstock pricing. 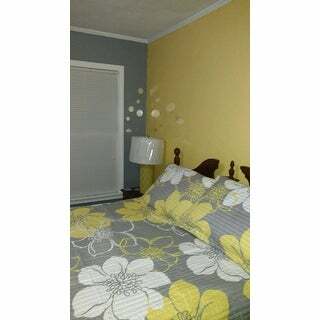 I loved the bedspread, it is a little shorter than I thought but it does fit the bed pretty good. I love how the colors come together with the room which is gray with a yellow accent wall. It was very reasonable and it was worth the price I paid for the bedspread. My daughter loved the quilt very much. This is beautiful very light weight glad I brought it. "Is the sizing for the Queen really 86 x 86?" The Queen size is 86 in x 96 in. The floral design is beautiful.